So, apparently, at least in the world of avante-garde cuisine, “spherification” is a word, and it means exactly what it sounds like. If you’re a fan of Top Chef, or even just Iron Chef America, you’ve probably seen someone pull out a steaming tank of liquid nitrogen and instantly up the hipness level of their otherwise run-of-the-mill appetizer. 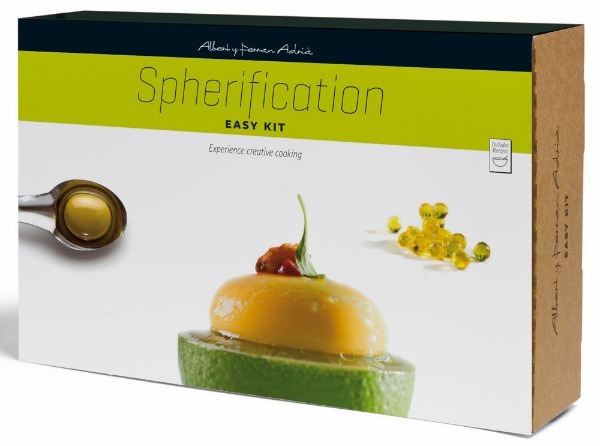 These molecular gastronomy kits from Spanish chef-brothers, Albert and Ferran Adrià, seek to put that power in your kitchen. They’re called Easy Kits, and there are four of them: Spherifiication, Cuisine, Patisserie, and Cocktail. Each comes with ingredients specific to respective recipes and techniques. For instance, “Gelly” is a 200 bloom gelatine texture in the Spherification kit that lets you to make your own globular mousse. Then there’s Lecite in the Cuisine box, so you can make flavored air. You’ll be enjoying marble-shaped vinegar in no time.